Kinchega National Park lies about 111km southeast of Broken Hill. I catch my first glimpse of the transformed Kinchega National Park from the back seat of a Cessna. To fly over an expansive, tree-lined lake in an environment previously known for its seemingly limitless red horizons is bizarre to say the least. Menindee Lake System has a holding capacity 3.5 times that of Sydney Harbour. Kinchega’s Menindee and Cawndilla Lakes are part of this valuable system. With the advantage of a view from above, it’s easy to imagine a time when these waterways were the lifeline of our isolated west – despite their penchant for trapping paddle steamers on dried-out floodplains. While taking to the air is a great way to gain a sense of perspective, the lakes are just as mesmerising when viewed from the ground. With a mélange of black, skeletal trees twisting their way out of the water, a smattering of pelicans and a vibrant pink sunset, this may be one of the best outback views NSW has to offer. In its previous pastoral life, Kinchega once sprawled from Menindee to Broken Hill, taking up a whopping 800,000 hectares. 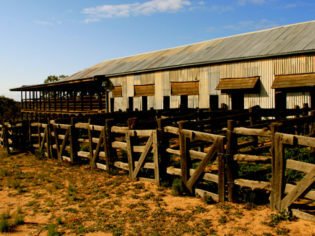 Remnants of this period, such as the photogenic Kinchega Woolshed, give the park an added dose of intrigue. 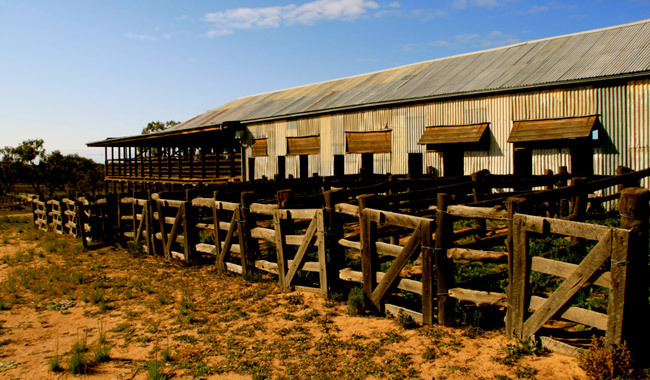 Established in 1875, the woolshed was the largest in Western NSW, and still smells faintly of the merino sheep that filled it for 98 seasons. In 1967, after shearing six million sheep, the Kinchega station ended its 100-year lease and re-emerged as a National Park. Yet the historic shearer’s quarters are still a great place to set up camp. While it may be the antithesis of a five-star boutique hotel, this budget, bunk-style accommodation is brimming with personality. It’s a stone’s throw away from the Woolshed and comes with a communal kitchen, roaring fireplace and the chance to spy a sizeable chunk of the Milky Way. Car-based or caravan camping is also available for those really looking to rough it. Just outside the Park’s gates is Menindee, a tiny settlement of 981 people that claims the second-longest operating hotel in NSW. However, the Maidens Hotel comes with a questionable history. In addition to helping derail the infamous Burke and Wills adventure, largely due to the actions of Kinchega manager William Wright, the establishment also led to the destruction of the paddle steamer ‘Providence’. A typical Outback Pub, the Maidens Hotel in Menindee has a questionable past and tons of character. To break up their trip down the Darling the vessel’s crew indulged in a few rounds at the pub. In their drunken state the men forgot to add water to the boiler causing the steamer to explode. Naturally, the 44,000-hectare Kinchega National Park can boast more than just a passing pastoral history. The oldest human inhabitants entered the area over 26,000 years ago and remnants of Australia’s semi-mythic mega fauna have been found around the frequently arid lakes. Likewise, the Barkinji Aboriginal people remain intricately connected to the area. So, while Kinchega may only draw in an average of 20,000 visitors per year you can expect them to be a pretty diverse bunch. They include German scientists who collect the toenail clippings of geckos for genetic testing, grey nomads, and families in search of an adventure. The kid-friendly Discovery tours that run during the school holidays are a fantastic way for families and inquisitive youngsters to get acquainted with the Park. Apart from numerous self-guided walks, one can also venture by car down the Lake or River Drive. But be warned, these unpaved roads can be closed when wet, so hang out for a sunny day. I spent four warm days within Kinchega and left feeling relaxed, inspired and reassured that minimalist accommodation, aerial adventures and unpredictable watery landscapes were all I needed for the perfect outback escape. Note: Liz Schaffer visited Kinchega National Park courtesy of NSW National Parks and Wildlife Service. Scenic flight courtesy of Silver City Scenic Flights. Kinchega Shearers Quarters, Kinchega National Park, Menindee. Maidens Menindee Hotel, Yartla St, Menindee. Silver City Scenic Flights, Broken Hill Aero Club.